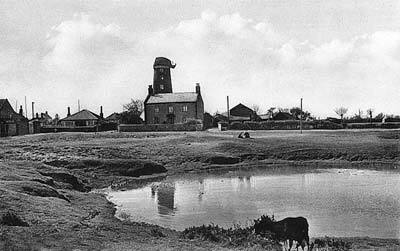 Hempton towermill was a seven storey towermill built in 1833 for John Jarratt. The large tower had a Norfolk boat shaped cap with a petticoat and held a 6 bladed fan and a gallery. The four double shuttered sails each had 10 bays of 3 shutters and were struck via a chain pole from the stage set around the 3rd floor. In 1835 the mill was running 2 pairs of 4ft 6ins French burr stones, 2 flour mills and an oat crusher. The sack hoist was powered by an endless chain. Harry Apling recorded that the mill was dated 1833 J. J. and that the mill started its working life with three pairs of French burr stones and one pair of Peak stones. Debts to Benjamin Carter of Rainham or Mr. John Jarrett, of Hempton. Notice to Debtors & Creditors of John Jarrett, late of Hempton, Farmer & Miller, deceased. Lot 1. 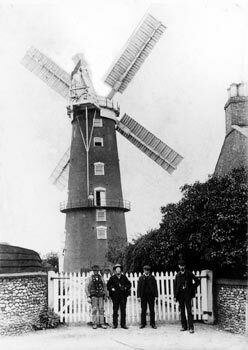 A Capital new built TOWER WINDMILL in Hempton in Norfolk with seven floors, patent sails, winds herself, carries two pair of French burr Stones 4 ft. 6 ins. In diameter & has two flour mills, is well situated for market & is capable of doing extensive business. Also a piece of Land adjoining the Mill containing by estimation 2a.2r.0p. This Lot is Freehold. Lot 2. Baking office & four Cottages adjoining Lot 1. Apply to Mr. Allen, Hempton, who will show the Premises, to Mr. Robert Leamon of Whitwell or to Mr. Stokes, Solr. Fakenham. A Capital TOWER WINDMILL with seven floors, Patent Sails, winds herself, carries two pair of Stones & two Flour mills, is well situated for Markets & capable of doing an excellent business. Also 2a.2r. of excellent Land & a Baking Office adjoining which together with the Mill is now in Full Trade & offers to any industrious man a desirable opportunity of establishing himself in business. Apply to Mr. Leamon, Whitwell or Mr. Henry Allen upon the Premises. 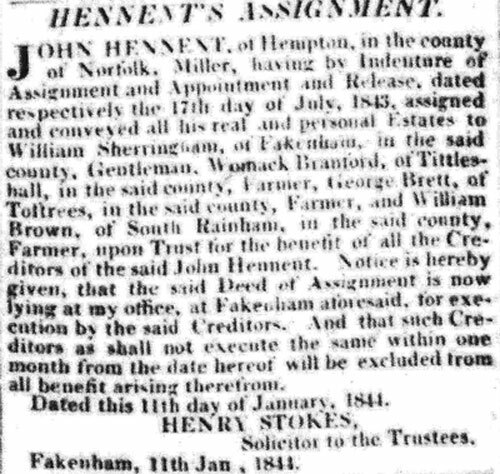 JOHN HENNENT, of Hempton, in the county of Norfolk, Miller, having by Indenture of Assignment and Appointment and Release, dated respectively the 17th day of July, 1843, assigned and conveyed all his real and personal Estates to William Sherringham, of Fakenham, in the said county, Gentleman, Womack Branford, of Tittleshall, in the said county, Farmer, George Brett, of Toftrees, in the said county, Farmer, and William Brown, of South Rainham, in the said county, Farmer, upon Trust for the benefit of all the Creditors of the said John Hennent. Notice is hereby given, that the said Deed of Assignment is now lying at my office, at Fakenham aforesaid, for execution by the said Creditors. And that such Creditors as shall not execute the same within one month from the date hereof will be excluded from all benefit arising therefrom. Horses … Household Furniture & other effects of Mr. John Hennent, Miller. 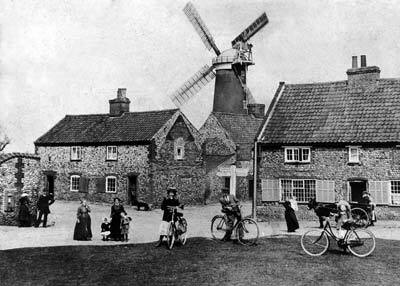 All that capital BRICK TOWER WINDMILL situate in the parish of Hempton in the county of Norfolk. Seven Floors, driving two pair of stones with Flour Mill & all requisite machinery for carrying on an extensive trade. Patent Sails & winds herself as the same was lately in the occupation of Mr. John Hennent. Also a comfortable Dwelling house near the said Mill & 2 acres of excellent land with all necessary Stables & Outbuildings. Particulars of Mr. Stokes, Solr. 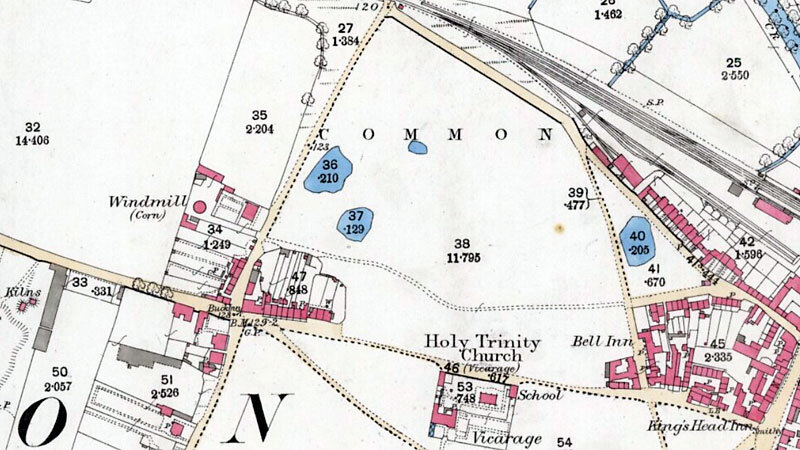 Fakenham or of Mr. Allen, Hempton who will show the premises. Lot 4. 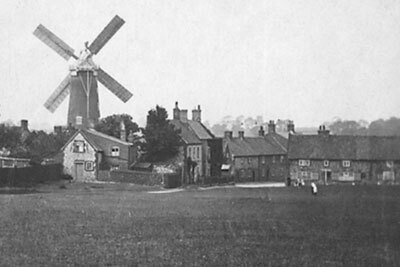 A very lofty Tower Wind Mill containing seven floors with excellent & powerful machinery, capable of doing a very extensive business & good Stables & Waggon Lodge & about 2 acres of Arable Land in the occupation of Mr. James Brooke, situate at Hempton adjoining the Town of Fakenham one of the best corn Markets in the county. Particulars of Mr. Loynes Solr. 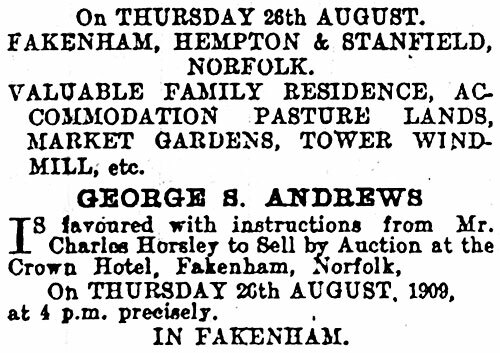 Wells, Mr. Allen the proprietor & of Robert Ansell, Auctioneer, Fakenham. Preliminary advertisements of 29 July & 5 August included. Extensive Brickyard with two Kilns & jamb of excellent brick earth & about 18 acres of land. 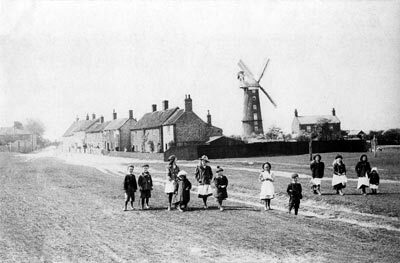 A very capital TOWER WIND MILL containing seven floors with all necessary machinery for doing a good trade, situate at Hempton near Fakenham in the County of Norfolk, with a comfortable Dwelling House, good Stable, Cart Lodge, Granary & 2 acres of excellent Land. Also a valuable Right of Commonage. Apply to Mr. Leamon at Whitwell, near Reepham, Norfolk. 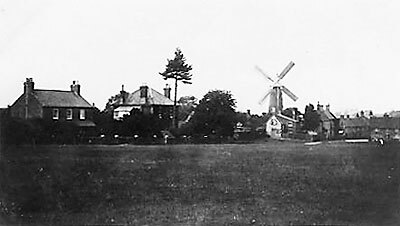 A very capital TOWER WINDMILL containing seven floors, with all necessary machinery for doing a good trade, situated at Hempton, near Fakenham in the County of Norfolk, with a newly erected Dwelling House, good stables, cart lodge & two acres of excellent Land, also a valuable Right of Commonage. WANTED, a Married Man about 35 to take care of a WIND & STEAM MILL. He & his wife will be required to live in the house. Apply to G.N. Stewardson, Fakenham. 1 10" Flat Saw file . For Binham . . . 6s. 7d. 1 Thrust " . . 15 - 2oz. 1 14" Rough Sq. file . Freehold Brick Tower Windmill, stable, gig house. Dwelling House & garden. Arable land. 4 Cottages & large gardens. 3 cottages & large gardens. Lot 3. Corn chandlers shop & house (in Oak Street) occupied by Mr. Horsley. Lot 25. 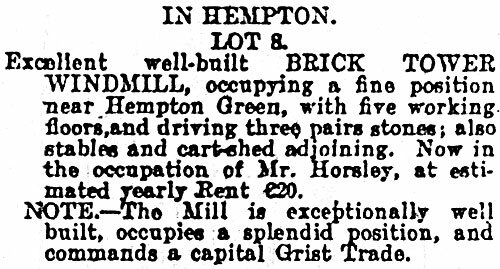 The well built Brick Tower Windmill with the Machinery & Gearing, Stable & Premises situate near Hempton Green, occupied by Mr. Horsley The Hempton Property is all Freehold..
Charles Horsley died Sunday May 28, 1911, aged 85. 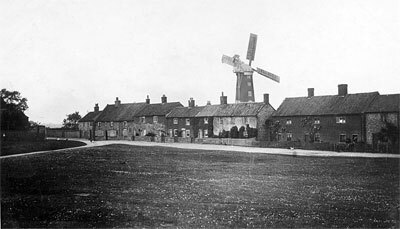 The mill was demolished during World War II, c.1940, as it was erroneously believed that the Germans were using it as a marker to locate nearby RAF West Raynham airfield. On 16th May 1970, Ernest & Arthur Howes of the Mill House wrote to Harry Apling. 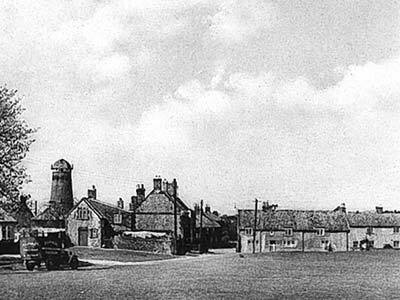 They mentioned that the site of the mill was behind a bungalow next to the Mill House and that the mill had been demolished soon after WWII while the Americans were still at RAF Sculthorpe. 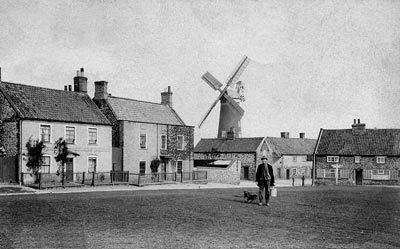 In 1973, J. H. Barber of Fakenham, wrote to Philip Unwin about the mill. 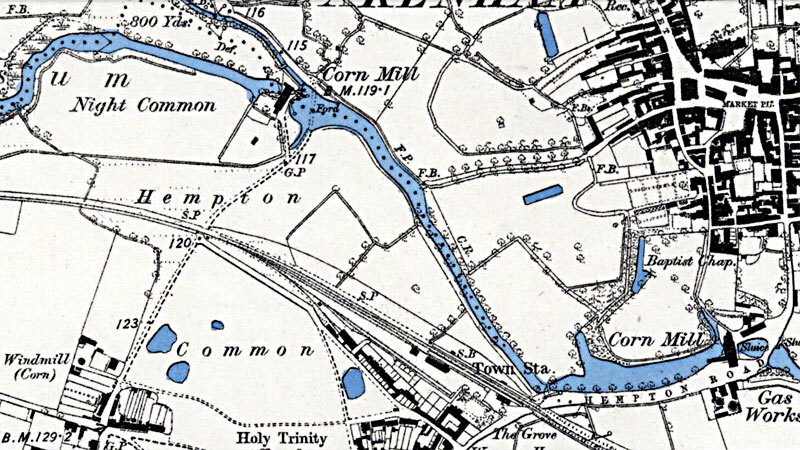 He related that he started working at the mill in 1912 at the age of 14 for the owners, Dewing & Kersley Ltd. and that he worked from 6.00am to 6.00pm. The mill had about 8 floors and ran 3 pairs of French burr stones, 1 pair of Derby Peak stones and an oat crusher; it also powered an endless chain hoist. 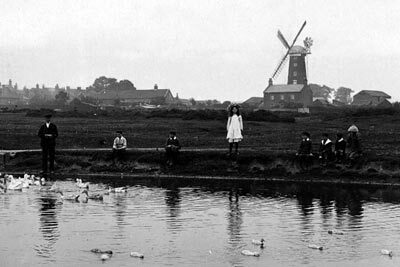 The mill ceased working in 1918 and was later sold not to work again, before being demolished during the second World War. Harold Banham of Hempton, wrote to Harry Apling in the 1980s to say that he was the son of Clare Banham. 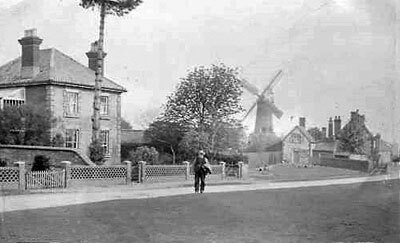 The mill was sold to Clare Banham c.1922 on the express condition that the mill was not worked and it was only used as a store. At that time all the machinery was still within the mill.